Should I buy Nikon D3200 or Canon T3i? You're not alone. Thousands of photographers have asked the exact same question. This guide will help you to make a choice you won't regret by providing an expert opinion combined with hundreds of user reviews analysis. These two top quality DSLR cameras are generally reckoned to be their respective brand's top entry level DSLR's, but how do they stack up against one another? Are you getting started in photography and looking to get your (first) DSLR? Me and thousands of photographers think that Nikon D3200 is the perfect choice for you. Look no further and get this camera or check out full comparison if you're considering Canon T3i for some reason. As can be seen from the table there Nikon has slightly better specs. Both are quality cameras for entry level DSLR's and are good value for money. Nikon also has lower price tag which makes it an obvious choice. Let's go through and take a brief look at how the two stack up in each category. When it comes to choosing my gear, I'm very detail oriented. After a long hestiation I've decided to buy Nikon D3200. The feeling when opening up just-shipped Nikon D3200 was priceless. I ensure you from my personal experience that you'll love Nikon D3200. With right lenses and proper technique, you'll get amazing results with this camera. You won't regret buying it. I'm Canon T3i owner for just about 2 months. Photography is my hobby but I take it seriously. I mostly enjoy landscape photography and T3i was ideal gear for it even though people are saying Nikon alternatives are better for landscape. Overall, I highly recommend T3i. Especially if you are a beginner and this is your first DSLR camera. With its slightly larger sensor the Nikon comes out on top here giving a maximum resolution of 6016 x 4000 pixels to the Canon's 5184 x 3456. This extra resolution doesn't mean a lot overall but comes in very handy for those involved in landscape or portrait work. Both cameras have exactly the same ISO range so this category is decided purely on performance. The Nikon begins to show some noticeable noise at an ISO as low as 800 while the Canon is still 'clean.' As the ISO goes up so does the noise in the 3200D, while the T3i continues to perform better, albeit still with some noise at lower amounts than the Nikon. This has to go down as a win for the Canon T3i. With double the number of presets for white balance the Nikon offers much more nuanced control over 'light temperature' than its Canon counterpart and is a clear winner in this category. Slightly more control over the focus points on the Nikon, with its 11, compared to the Canon's 9 but not a great deal to choose between them and neither, to be honest is at their best in this category. Slight edge to the Nikon. Both cameras offer a 3 inch LCD screen but, in this case it is the Canon T3i that comes out ahead. With a higher resolution screen (1,040k to 921k dots) which is also fully articulated the Canon has more versatility than the fixed screen on the Nikon. Clear win for the T3i. 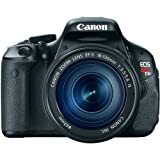 There is virtually nothing to choose between the two here but, as with still photography, there is a case to be made for the Canon performing better in lower light conditions so this category would just be in favor of the Canon T3i. Although neither camera is over-bulky the Nikon has the advantage here of being both slightly smaller and lighter. Although the differences are negligible even a slight advantage can be noticeable when carrying your gear around for long stretches of time. A narrow win for Nikon in this category. In common with virtually every camera nowadays both the D3200 and the T3i have a built-in flash, but, to be honest, it's a feature that most 'serious' photographers would tend to avoid using due to the harsh shadows it always creates. That said it's always better to have it than not and, with a very slightly higher usable range of 13m (around 40ft) the Canon T3i just edges this category. With the total number of available lenses for the Canon T3i standing at 266 to the Nikon D3200's 257 the Canon has a slight advantage in this category, but with every type of lens imaginable available for both it's not a significant difference. A port for attaching an external microphone is an advantage for video shooting as it eliminates any AF motor noise but with both models featuring this option it has to be a tie again. When shooting action such as sports or wildlife it is a good idea to use the continuous burst facility found on both cameras and , in this respect, the Nikon D3200 comes out slightly ahead at 4 shots per second to the Canon T3i's 3.7 but neither is particularly impressive in this category. Slight nod to the Nikon. Battery life can, of course, be very important, particularly when you are far away from any power source to recharge or don't want to carry too much weight, when out in the wilderness doing landscape or wildlife photography and in this category the Nikon comes out well ahead with a life of some 540 shots compared to the Canon's 440. A clear win for the D3200. Both have exactly the same specs as far as shutter speed goes, from 30 seconds for those long exposures, to 1/4000sec to freeze virtually any motion you can think of. This category has to be a tie. As with the 'dimensions' category there isn't a great deal to separate them, but a slightly lighter Nikon takes the prize here too. Both models feature an optical pentamirror viewfinder with 95% coverage and with magnification of 0.85x to 0.8 x in favor of the T3i, this is the narrowest of wins for the Canon. One category not taken into account until now is price. In general the Nikon D3200 is still cheaper than the Canon T3i, as it was when they were first introduced. The Nikon is in the region of $100 cheaper than its Canon counterpart and with its performance more or less matching the T3i would certainly seem to represent better value for money. Both cameras are exceptionally good entry level DSLR models and would be among the best you could buy when making the move into DSLR photography, especially if you don't want to risk large amounts of money. The differences between the two are generally rather small and depending on what type of photography you are interested in either should serve you well and certainly should not disappoint. On balance, given the performance levels obtainable from both and taking price into account, as well as a few of the more technical aspects of each camera, the Nikon D3200 would probably have the edge, but only just. Happy clicking!